I’ve been meaning to share some of my joining methods for ages. 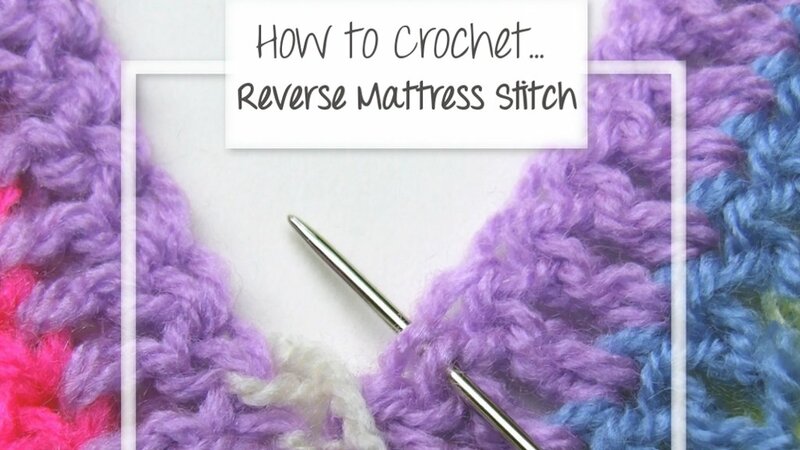 I shall start with my Invisible Seam Reverse Mattress Stitch which joins squares flatly (no big ridges at the front or back) and is a nice sturdy join. It’s almost the same as the Mattress Stitch but is worked with the wrong sides facing and through the two back loops of each stitch. I’ve used a contrasting yarn for the photographs so that you can see what’s going on and how the sewing disappears. Begin with wrong sides facing and join yarn in the corner of each square. Personally I use a figure of eight, leaving a long tail which I weave in later, but you can get the yarn started in whichever way you prefer. Continue Step 1 and Step 2 and remember to tighten the yarn every few stitches until the squares are joined and end yarn as you would normally. 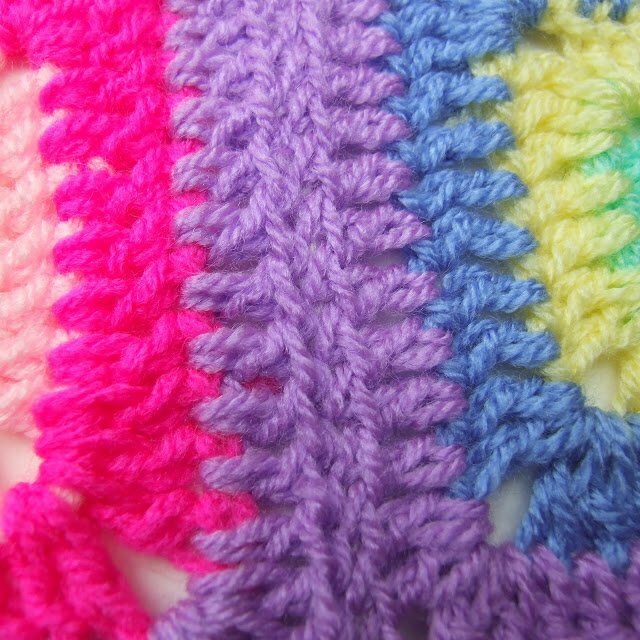 This method works really, really well for joining different coloured squares together like granny squares or the Babette Blanket and you don’t have to be too concerned what colour you use to join as long as its fairly neutral. Hope this makes enough sense to help some folks! I'll have to try this joining method. I usually join on the go as I find it easier and saves yarn but in some cases I think sewing the squares or other shapes together gives better results. Makes perfect sense! 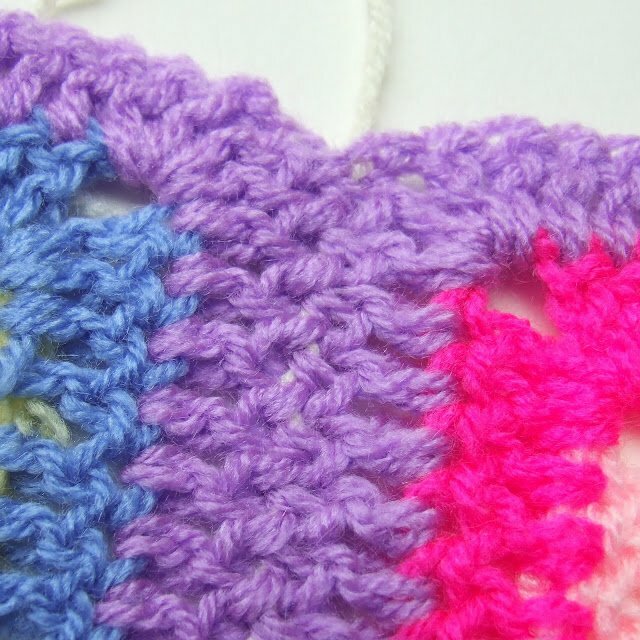 I've mostly used the double crochet join because I quite like the added texture. As you say this is great for joining different colours. I just have to remember it now! Thank you so much for posting this! I could not figure out how to do this type of join! I can't wait to try……thank you for posting. Thanks for the great tutorial. It really works! Very helpful for my babette-esque blanket. Tried this out and it works great! Thank you so much for sharing! These are great instructions! Thanks for this post. 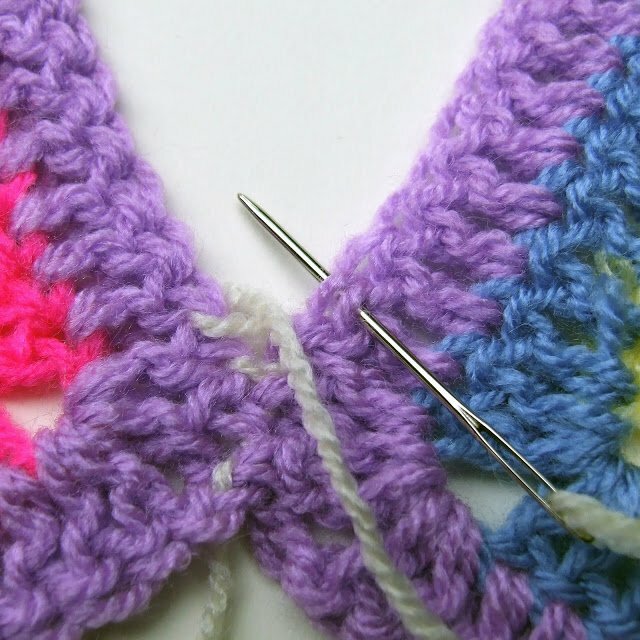 Thanks for this I am about to start joining my babette blanket, do yo have any tips for making sure the corners go together neatly – I have heard they can be problematic! The best way to make the corners neat is to block all the squares first. 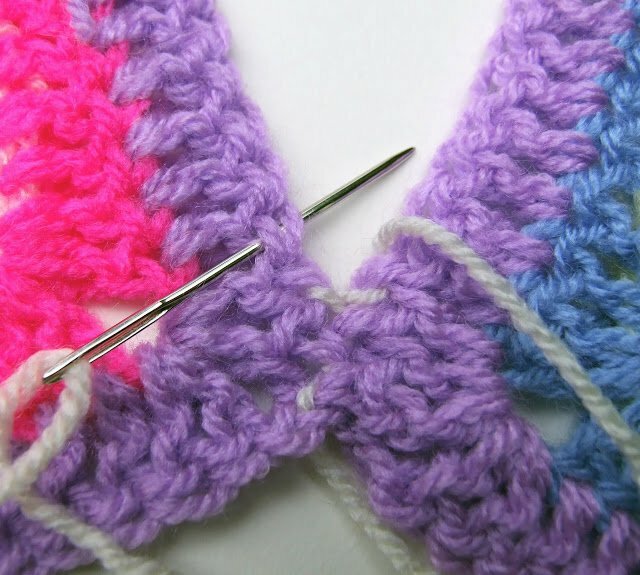 Or, when all the squares have been joined, sew a tight cross stitch through each corner to pull the stitches together. If you sew the cross stitch through the back loops on the wrong side it shouldn't be visible. Thank you so much for sharing your invisible seem. I'm working on my first blanket for my first grandson and didn't want a ridge when I joined the squares. The design is a gingham check and I'm using earth tones (brown, green, and tan). This is just want I needed to join them. Fifteen more squares to go and then I start joining! LOVE this tutorial – thank you so much for taking the time to share. Greatly appreciated. I am making a cancer blanket for someone which requires a ton of granny squares. I was looking for a seamless way to put them together and came across your tutorial. I am going to try it, but was wondering how you finish off. Hi, I just sew the end back about 3 – 4 inches in a zig zag. 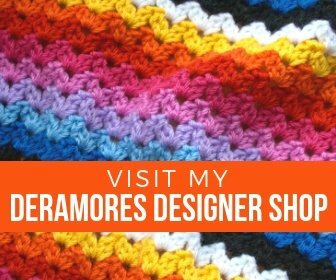 Hope the tutorial helps and I'd love to see your finished blanket! 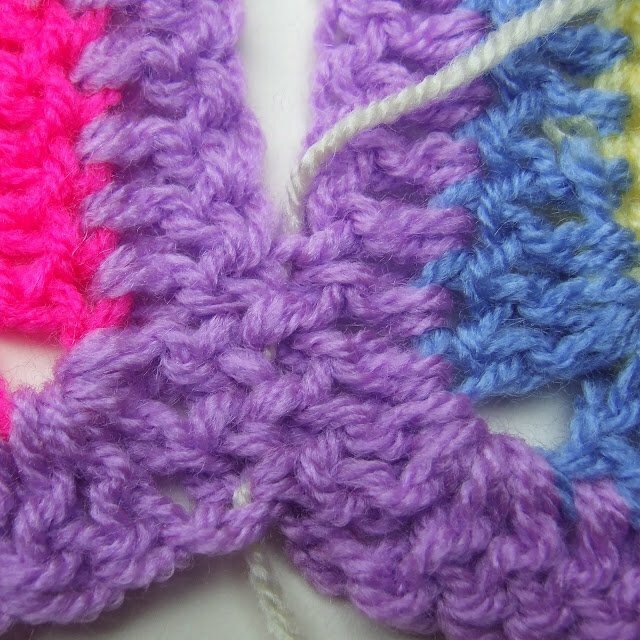 I am so glad to see a pic-tutorial offered on this method to join squares. I have used it for years (too many to count) and it’s my favorite. Thank you for posting the How-To.